A glorious afternoon’s racing took place under blue skies as the first of two ‘Art of Racing’ days took place at Pontefract on Monday. With guest tipsters, guest best turned out horse judges and commentary booth, it was a day truly dedicated to everything we know and love about the Sport of Kings. Racing Welfare were out in force to celebrate Racing Staff Week. They provided the winner of the Lifetime in Racing Award, which went to Alan Hogg who has worked for Mrs Peacocks Manor Farm Stud in Middleham since 1965 and was promoted to head stud groom in 1978. The first race was run in his honour. The feature race was the £20,000 ebfstallions.com Fillies’ Handicap. Adam West made the 418-mile round trip from Epsom worthwhile when his Bambino Lola took the race under John Fahy. Having finished third at York last month behind the Hugo Palmer trained Encrypted, the daughter of Australian sire Helmet stuck her neck out to battle all the way to the line to beat Julie Camacho’s Brockholes. 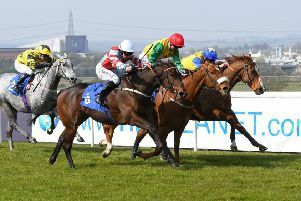 The winner could be destined for a return trip to Pontefract for the season’s richest race – the £60,000 Listed EBF Highfield Farm Flying Fillies’ on Sunday, August 19. Franny Norton always rides Pontefract well and he steered Blown By Wind to victory in the British Stallion Studs EBF Spindrifter Conditions Stakes, making all of the running. The Mark Johnston trained colt won impressively down at Ascot back in May and was not beaten far in the Group 2 Coventry Stakes at the Royal meeting. The trainer has a great record in this race and often runs his more precocious two-year-olds. This one is definitely for the future. Highly Sprung took the opener under a fine ride from champion jockey Silvestre De Sousa for trainer Les Eyre. The gelding returned to the winners’ enclosure again after winning here last month. Carrying top weight of 10 stone, the son of Zebedee sprinted away from his rivals by an impressive 3¼ lengths. De Sousa continued his fine run of form by winning on the Ralph Beckett trained Construct in the one-and-a-half mile handicap later in the afternoon. David Simcock and Stevie Donohoe had just one representative at the West Yorkshire track on Monday and they took the 16th Running of the Wilfred Underwood Memorial Classified Stakes with Walk On Walter. The 15/8 favourite made all the running over the six furlong trip and stayed on well despite the rider dropping his stick in the final strides. Having being gelded at the back end of last year, the Newmarket raider has really come to himself having not been out of the first two placings in 2018! The course’s 2017 champion jockey Danny Tudhope took the Gallop Racing Handicap Stakes for trainer David O’Meara when Lamloom made all on the quickening ground. Gallop Racing, a growing syndicate who have horses at O’Meara’s, gave their name to the race. Pontefract’s Annual Badge Holders had also enjoyed a trip to the O’Meara stable before racing and were up close and personal to the horses in the barns and on the gallops. Seven amateur lady jockeys went to post for the final race of the afternoon. Becky Smith, from the Micky Hammond Stable, took the race aboard Quoteline Direct for her boss. Having held the horse up in rear throughout, she switched her mount to the outside in the final furlong and stayed on strongly. The horse has an entry at Haydock for Friday and could make it a quickfire double!